African Studies Review (ASR) is the flagship scholarly journal of the African Studies Association (USA). The ASR publishes the highest quality African studies scholarship in all academic disciplines. The ASR’s rigorous interdisciplinary peer review seeks to contribute to the development of scholarly conversations of interest to the diverse audience of the Association’s membership and to the growth of African studies in North America, on the African continent, and in a global comparative context. 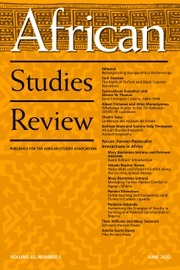 Interested in the African Studies Review journal? Find out what we're about!